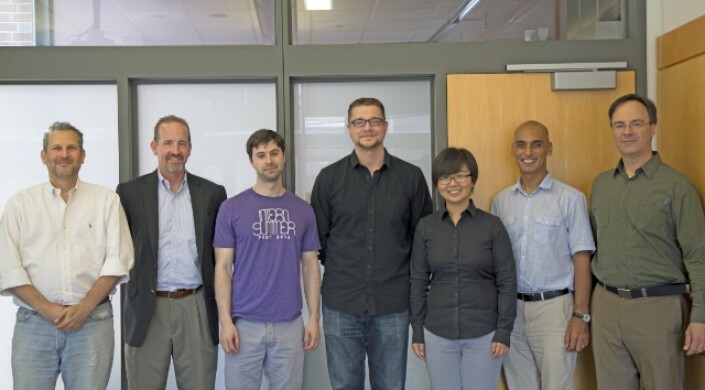 Five computer science graduate students at the Harvard John A. Paulson School of Engineering and Applied Sciences (SEAS) have been named 2018 Siebel Scholars. Jean Pouget-Abadie, Hongyao Ma, Andy Miller, Brandon Reagen, and Sam Wiseman will each receive a $35,000 award for their final year of graduate studies. They are among more than 90 students selected worldwide from 17 partnering institutions by the Siebel Scholars Foundation, which recognizes exceptional students at the world’s leading graduate schools of computer science, as well as business, bioengineering, and energy science. On average, Siebel Scholars rank in the top 5 percent of their class, and many are within the top 1 percent. The five SEAS students join more than 1,000 Siebel Scholars who are global leaders in academia, government, and industry. Siebel Scholars are chosen by the deans of their respective schools on the basis of outstanding academic achievement and demonstrated leadership qualities. Jean Pouget-Abadie, a computer science Ph.D. candidate, is advised by Salil Vadhan, Vicky Joseph Professor of Computer Science and Applied Mathematics, and Edoardo Airoldi, Associate Professor of Statistics. His current research focuses on causal inference with network interference, which aims to better understand A/B tests when the experimental units are not independent. He has served as a teaching fellow for Machine Learning (CS 161), interned on the Core Data Science team at Facebook and the music recommendation team at Spotify, and collaborated with LinkedIn and Google to better understand the practical problems facing experimentation platforms at large-scale internet companies. He earned his undergraduate degree in mathematics at École Polytechnique in Paris. Hongyao Ma is a computer science Ph.D. candidate, advised by David C. Parkes, George F. Colony Professor of Computer Science. Her research is broadly situated at the interface between economics and computer science, and draws on concepts from multi-agent systems and game theory. Hongyao received her master’s degree in 2014 from Harvard, and bachelor’s degree in 2012 from Xi'an Jiaotong University in China, both in electrical engineering. She visited Technion in the summer of 2016, worked as a research intern at AT&T Labs Research in the summer of 2013, and visited UCLA as a part of the CSST Program in 2011. 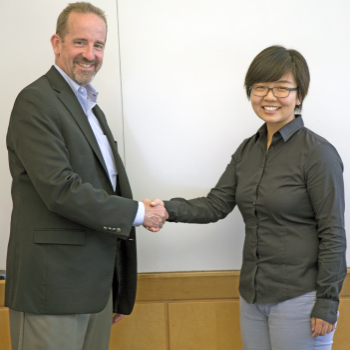 Hongyao served as a graduate student mentor in the SEAS connect program and Graduate School of Arts and Sciences host student program from 2013 through 2016. In addition, she was a member of the public relations team in the Harvard Chinese Student and Scholar Association from 2012 through 2014. Andy Miller is a computer science Ph.D. candidate, advised by Ryan Adams, Associate in Computer Science, Finale Doshi-Velez, Assistant Professor of Computer Science, and Luke Bornn, Assistant Professor of Statistics at Simon Fraser University and a Visiting Scholar at Harvard. He earned his bachelor’s and master’s degrees in computer science from Brown University. Miller, who is studying machine learning and statistics, develops probabilistic models and inference methods for complex, high-dimensional data with applications ranging from astronomy to health monitoring to sports analytics. His methodological research focuses on the development of flexible and computationally scalable inference procedures for probabilistic models, with the goal of making data analysis faster and more reliable. Miller is a co-founder of the XY Research group, which has produced influential research in modern sports analytics; he has collaborated with and consulted for teams across multiple professional sports leagues. Brandon Reagen is a computer science Ph.D. candidate, advised by David Brooks, Haley Family Professor of Computer Science. He received his undergraduate degree in computer systems engineering and applied mathematics from UMass Amherst. His research focus has stretched from building and modeling custom hardware accelerators to realizing their potential by applying his research to the RoboBee brain chip. He has also been on the frontier of discovering new methods of optimizing deep learning hardware. With the Minerva project, he was able to reduce the power needed to execute neural networks enough to deploy them in even the most constrained environments via novel co-design techniques between learning algorithms and circuits. In addition to deep learning, he has focused on using other aspects of machine learning, namely Bayesian Optimization, to automate and further improve hardware design. Reagen also has advised many first-year graduate students, managed an REU student for a summer, and served as lead teaching fellow for three courses. Sam Wiseman is a computer science Ph.D. candidate, advised by Stuart Shieber, James O. Welch, Jr. and Virginia B. Welch Professor of Computer Science, and Alexander Rush, Assistant Professor of Computer Science. Wiseman holds a bachelor’s degree in philosophy from Princeton University and a master’s degree in computer science from Harvard. His research involves applying machine learning (especially deep learning) methods to problems in natural-language processing. He has worked on methods for text generation, earning an honorable mention for best paper at the 2016 Conference on Empirical Methods on Natural Language Processing, and on computational discourse, improving the state-of-the-art in coreference resolution twice. Due to his expertise, Wiseman served on the program committee for the Coreference Resolution Beyond OntoNotes workshop. Wiseman has won two teaching awards at Harvard, and led the effort, with another student and a professor, of revamping Harvard's undergraduate machine learning course. He has interned twice with Facebook's AI Research Group, and earlier developed software at an investment bank and an educational software company. The Siebel Scholars program was founded in 2000 by the Siebel Foundation to recognize the most talented students at the world’s leading graduate schools of business, computer science, bioengineering, and energy science. Today, the foundation's active community of leaders serves as advisors to the Siebel Foundation and works collaboratively to find solutions to society’s most pressing problems. The Thomas and Stacey Siebel Foundation, a nonprofit, public benefit corporation, was established as a private foundation in 1996. Its mission is to foster programs and organizations that improve the quality of life, environment, and education of its community members. The Siebel Foundation funds projects to support the homeless and underprivileged, educational and research programs, public health, and alternative energy solutions. The Siebel Foundation engages in strategic philanthropy; as such, it does not entertain grant requests, but invests in targeted highly leveraged programs and in projects it founds and operates. For more information, please visit www.SiebelFoundation.org.